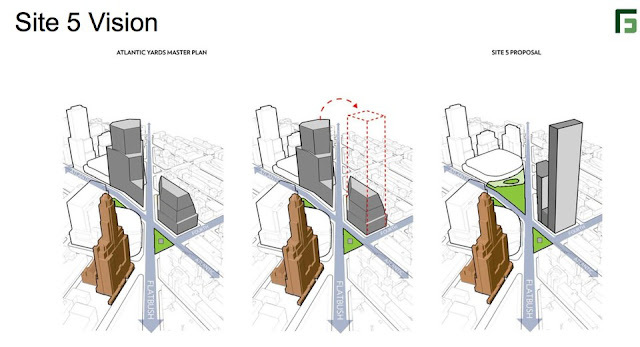 That means that SHoP, which designed the other two towers (461 Dean and 38 Sixth) on the arena block and in 2011 produced a rendering (below left) that included the third tower, is off the job. Why is that? They didn't say, but the original plan was to build a cluster of modular towers (though SHoP designed at least the first one in both modular and conventional styles). "Right now... we're working on 2.7 million square feet of affordable housing, five towers," SHoP principal Gregg Pasquarelli said at a forum in September 2011. But Forest City gave up on the modular plan, which turned out to take longer and cost more than promised, and then sold a majority stake to Greenland. Also, it should be noted, while SHoP got much praise for wrapping the arena--designed initially by Ellerbe Beckett--with a pre-rusted metal skin, and adding the wraparound oculus, its design of 461 Dean and 38 Sixth has not received applause. Part of that might that modular construction imposed--or encouraged--a boxy, rectilinear design. Another might be the silver/red/blue color palette. Whatever the reason, the Perkins Eastman design, however unspectacular at first blush, seems more glassy, and with at least one slight wedge. Also note a contrast between the two designs, with the SHoP version clearly more sectional. That's because, in 2013, Empire State Development--the state authority that oversees/shepherds the project--approved changes to the building's setbacks, moving them closer to the street. The rationale was to allow the approved amount of bulk within a smaller development envelope, since the B4 footprint was constrained after the arena was redesigned in 2009. It should be noted that Perkins Eastman would be the fifth architectural firm involved in the project's towers: SHoP designed two towers on the arena block; CookFox designed the two towers built on the southeast block; KPF designed the unbuilt B12 (615 Dean), on the southeast block; Marvel Architects designed the unbuilt B15 (664 Pacific) just east of the arena block. The latter two designs, which had no affordable housing, were unveiled at a time when it was expected that they would qualify for the 421-a tax break. Now all buildings must contain on-site affordable housing to qualify for the tax break. So B12, for example, will become a rental building, rather than contain condos, and B15 will be 30% affordable, as noted in previous coverage. Will TF Cornerstone and Brodsky keep the previous architects and simply modify their designs? Unclear. Of course, Forest City originally insisted that architect Frank Gehry, announced during more flush times as the Atlantic Yards guiding genius, would design the entire project, even though he said he'd typically bring other architects into the mix. Also, as I wrote, the entrance of TF Cornerstone and Brodsky also means that the project will in fact be accelerated by the presence of multiple developers, despite official resistance to such a proposal when proposed by project opponents and critics. Will B4 be the largest tower? What about Site 5, and office space? 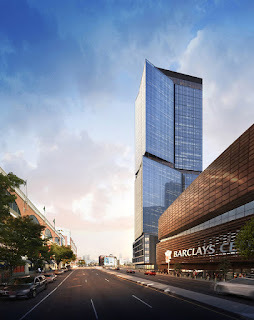 Approved at 511 feet and some 824,629 square feet, B4 was to be the largest in the entire project, outside of the long-delayed and seemingly jettisoned B1 (aka "Miss Brooklyn"), the office tower once planned to loom over the arena, rising from the intersection of Atlantic and Flatbush avenues. 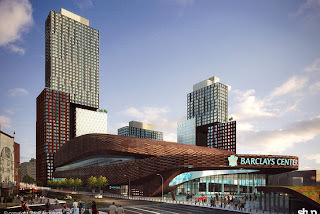 Several recent news reports, surely parroting the press release, referred to B4 as the project's tallest building and also quoted Greenland's Scott Solish: “Greenland Forest City Partners is now in a position to accelerate development at Pacific Park, where we are fully committed to delivering industry-leading, thoughtfully designed residential buildings and community space to Brooklyn." That omits the plan for Site 5, catercorner to the arena block, currently home to P.C. Richard and Modell's, and most recently promoted as a flagship office tower suitable for a new-economy firm, such as for Amazon's second headquarters. Could it be that, following the successful argument for a giant residential tower at 80 Flatbush, Site 5 will now be promoted as mostly residential? As to whether B4 will be the tallest building, well, it's the tallest building currently approved, but I suspect that statement was misdirection. Greenland Forest City has long intended to transfer the bulk from B1 to Site 5. A 250-foot, 439,050-square-foot building was approved at Site 5. With the transfer of bulk, a giant two-tower project would be achieved, as I wrote in July 2016, at 1.1 million square feet and up to 785 feet tall. That plan has not yet been approved by Empire State Development, but the state authority has reliably complied with the developer's requests. 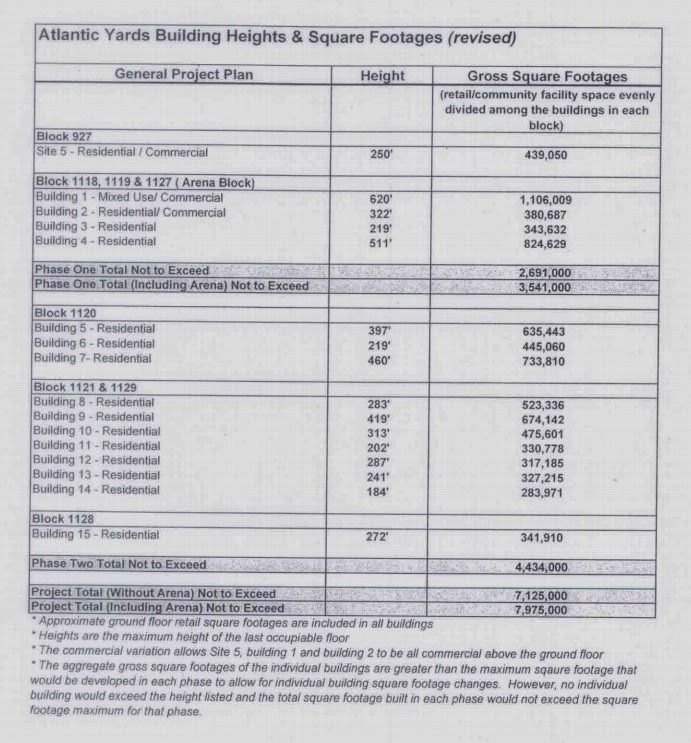 So stay tuned; surely the recent City Council approval of 80 Flatbush, with a tower stretching 840 feet, gives Greenland Forest City new ammunition for a drastic change in scale near row houses.